Dr Quratulain Bakhteari in 1996 helped to conceive a learning space for the young people in Pakistan by forming Institute of Development Studies and Practice (IDSP). It is a National Institution which opens learning spaces for the young and deprived population to empower them for generating and regenerating responses to the existing challenges of education, learning, livelihood, peace and pluralism. To date, over 500 learners drawn across Pakistan have graduated from the IDSP courses and are using the skills and tools acquired to promote community and human development. One of the projects of IDSP is Child Protection Centers (CPCs) which have been developed for the young children roaming on the streets. Apart from providing training, children are also provided eatables to motivate them to visit these centres. Two of such CPCs (one for boys and one for girls) are located near Kasi street Double Road on the edge of Quetta City. Each center also has a few PCs to teach the young children who either work in nearby auto workshops, as helpers at shops or collect garbage on the streets. 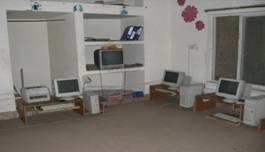 There was no internet connectivity at the centre and it was catering for a large number of children by teaching them computer basics like MS Paint and learning-by-typing alphabets. When Universal Service Fund (USF) launched its Pilot Project “Conversion of Computer Centres into Multi-purpose Community Telecentes”, these CPCs saw it as a great opportunity for enhancing their services. Two centers were selected by USF as part of the Pilot Project of 11 Computer Centers to be provided Broadband. The provision of broadband by USF has completely revamped these centres. Children working in auto-workshops are being provided information about the modern tools and techniques, garage safety measures etc through the internet. Female students are benefitting by browsing websites of different livelihood skills such as making decoration items, knitting, stitching etc. The main concept behind this is to enable girls and boys create better value and space for their livelihood and share work with others. These centres are also a source of entertainment for these children because they get amused by accessing cartoon clips on internet. One of the children, twelve year old Ameer Magsi who works in an auto workshop nearby says “Before coming here, I used to spend the whole day at the workshop. This centre has made me realize that I can learn much more than just simple repair work at the workshop. 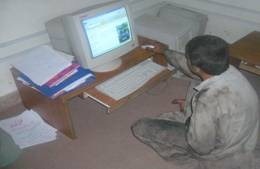 Apart from this, I have been shown internet websites regarding health and hygiene & recreation”. These CPCs are now not only visited by young children but even elder people are benefitting from them. One of the significant benefits of broadband at such centres is on-line availability of forms for child-birth registration, Hajj application and NADRA CNIC forms etc. In order to ensure positive utilization of broadband internet at these centres a set of policies has been made which includes informing the children that not all the information on internet is good, true and helpful. Moreover, care is taken that only the beneficial, relevant and safe websites are selected for the use of children. Through this pilot project , USF has tried to open the doors to opportunities for these children and enabling them to contribute towards the society in a constructive manner. To take this project further and for spreading the socio-economic benefits, USF intends to provide Broadband connectivity to most of the 300 ‘Computer Centers’ in rural areas, that USF has “un-earthed” in the recent past in the first phase. IDSP is doing good job in Pakistan. Keep it up.